Maria Vazquez has a love/hate relationship with her mother, Ninexin, a larger than life figure. While she was out leading the revolution, she left Maria to be raised by her grandmother, Isabela, and grandfather, Ignacio. And in Maria's eyes, her grandparents can do no wrong. 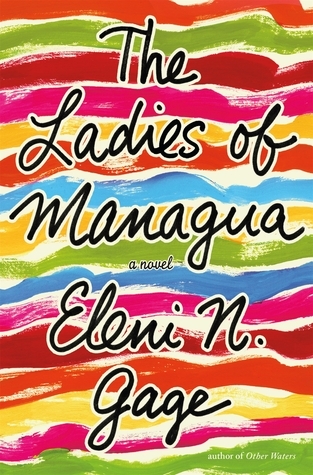 The Ladies of Managua follows the lives of these three generations of women. Her father's death at an early age adds to the abandonment that Maria feels by her parents. While he left her by death, her mother chose to leave her and lead the Nicaraguan revolution. She has a good relationship with her grandfather, but can't help feeling that a part of her is incomplete because she never knew her father. We see her involved in a relationship with an older man, a temperamental artist that takes her for granted. As she bends to his will, at times forsaking her own desires, you have to wonder if he is a replacement father figure for her. Even as he tries to right the wrongs in their past, I found myself rooting against him, believing that she would be better suited with someone other than him. Ninexin is a complex individual, shrouded in layers of secrecy. She doesn't strike me as a maternal character, so when she makes attempts to reach out to Maria, it's not difficult to understand why Maria rebuffs her attempts. As readers, we know that Ninexin is now a high level government official and revered by many in the country, but we're only given a glimpse of her on a personal level. Even as she begins to show her "real" side, Maria is unsure of what to make of it. It's only when Ninexin completely lets her mask fall that Maria begins to understand the sacrifices her mother made for her in the name of the revolution. Bela is absolutely my favorite character. When we meet her in present day, she's mourning the loss of her husband. But we learn that he was not the great love of her life, that would be Mauricio, a man that courted her during her time at boarding school in 1950s New Orleans. I've visited New Orleans several times, but reading it through the eyes of a teenage girl in days past was an eye opening experience. At a time when young women were expected to be prim and proper, Bela was bold, though not brave enough to go against her family wishes. Still, the present day Bela is bold and brave. She's reached an age where she has little regard to how people view her and she rarely bites her tongue. Although the relationships among the three women are the heart of the story, I also enjoyed reading about their relationships with Ignacio - husband, father and grandfather. Even though he had other grandchildren, you can tell he went out of his way to make Maria feel special and to make sure she didn't lack paternal influence. It would seem that all three women had a special bond with Ignacio. He wasn't the man Bela initially wanted, but he was the man she needed. He didn't necessarily approve of, but understood and supported Ninexin's decisions. And he stood in the gap for Maria when her own father couldn't. I was initially drawn to this book because of the colorful cover, but was quickly drawn into the lives of the characters. If you love a good generational saga with intense characters, this is a must read.